My name is Matt McHale and Paul Pierce is the motherf—-ing truth. Quote me on that and don't take nothing out. Oh, and please visit Basketbawful. Enjoy! Sorry, Mr. former Vice President. With all due respect to Al Gore and his Antarctic ice core samples, I think Game 1 of this year's NBA Finals disproved his theory about the dangers of greenhouse gases and their effect on the world's climate. The real source of the global warming menace? Paul Pierce. That is the motherfucking Truth. And that Truth got shoved down the Lakers' throats last night — despite a few freaky-scary moments in the third quarter — and the Celtics took a 1-0 series lead thanks to a very Truthful 98-88 win. Pierce scored 22 points on 7-for-10 shooting, but his biggest contribution to the Boston cause was his Willis Reed-like return from a sprained knee in the third quarter. The injury took place with 6:49 left in the period when teammate Kendrick Perkins bumped into him from behind. Pierce dropped like he'd just been hit by a photon torpedo or something, and he spent several minutes writhing in agony on the Garden floor. Said Pierce: "I thought I tore something; that's the way I felt at the time. Usually when I go down, I'm getting right back up, but it was an instance where I turned my knee and it popped, and I was just in pain where I couldn't move." 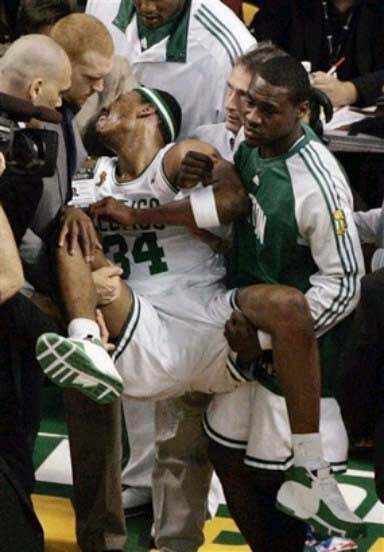 Let me tell you, watching Brian Scalabrine and Tony Allen literally carry Pierce off the court made me think three things: First, "Oh my God, this series is over." Second, "That's really the best way to take an injured player back to the locker room? Seriously?!" And third, "That may be the only time we get to see Brian Scalabrine during the Finals." But hey, it turned out the Celtics and their fans didn't have anything to worry about. Pierce came bobbing and weaving out of the locker room just a few minutes later, and it was without question the most chilling moment in the Garden since Larry Bird came back from smashing his face on the parquet floor back in 1991. The crowd surged to its feet, Kevin Garnett clenched his fist and let out a "Yes!" and Pierce — who officially checked back in at the 5:04 mark — immediately hit two three-pointers from the exact same spot to give the Celtics a 75-71 lead. The stuff of legends, right? Or maybe it was the work of the divine. That's sort of what Pierce thought. "I think God send an angel down and said, 'Hey you're going to be all right. You need to get back out there.'" Huh. Maybe our Lord had money on the game or something. But believe it or not, it wasn't all Paul Pierce. KG scored 24 points (despite going 3-for-13 in the second half) to go along with 13 rebounds, Ray Allen had 19 points, 8 rebounds, and 5 assists, and Rajon Rondo added 15 points and 7 dimes. Moreover, the Celtics controlled the boards (46-33) and held the Lakers to 41 percent shooting (33-for-77). It sure helped that Kobe played very, uh, non-MVP-like. He scored 24 points and dished out 6 assists, but he also committed 4 turnovers and shot an Iverson-esque 9-for-26 (although Mark Jackson and Jeff Van Gundy freaked the hell out about every single one of those nine makes). Pau Gasol (15 points, 8 rebounds, 4 assists), Derek Fisher (15 points, 6 assists) and Lamar Odom (14 points, 6 rebounds) helped keep the Lakers close, but L.A. still lives and dies by what the Mamba does or doesn't do. Make no mistake, though: Kobe's poor Game 1 performance will only serve to motivate him. "I had some good looks, they just didn't go down for me. I just missed some bunnies. I'll be thinking about those a little bit." Mull it over, Mamba. You have until Sunday.